Great conditions early, expert mode enabled later. With drizzle and rain on the coast Friday night, the promise of Post Frontal conditions Saturday looked good. Numerous private pilots were on the schedule, students were blocked for the day due to Insurance reasons. Lot's of activity early on. Larry, Bart and Richard assembled the Russia as part of their prepping an assembly guide. Jan and Andy worked on Andy's Russia to get it's Annual Complete. Pancho helped Julie and I assemble the Duo after our relatively leisurely arrival around 11. Calm winds as the lift was straight over the top of us. We should have come earlier. Driving in from the SW, the wave was easily visible in the clouds. It looked like the morning would have held good wave conditions and calm surface winds. Bart readies for a flight at the controls of the Duo. In prep for flying the Russia, I agreed to let Bart fly the Duo with me monitoring in the back seat. It's unlike the Russia except for tailwheel and retracts. Bart did fine aside from getting a little behind the airplane at first. 20 meter wings can be a little more work than a 1-26. Just a tad more inertia to deal with. Bart on tow behind Andrew. We landed after a pattern tow and a cycling of the gear to try to ingrain that into his brain and rolled out to the end of 13 where we were moved around Joe Anastasio who was prepped to take off. About this time, the winds started to pick up. 90 cross no less. Only about 8-10knots when Joe took off, but building fast. 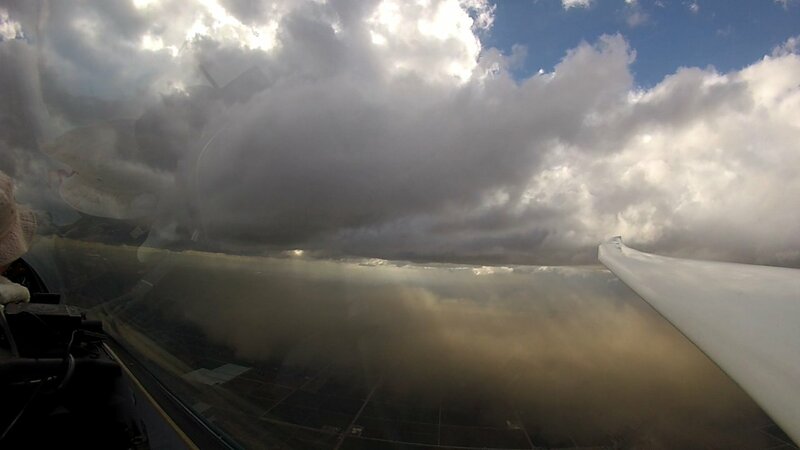 Dust was being picked up in the fields as the rotor mixed down to the surface with the building convection. Andrew was back quick and handled the crosswind nicely. Julie and I were ready to go, but winds were rising and at least 15knots now. I asked Andrew if he was comfortable, thankfully for me he was. The acceleration was slow. From our vantage point, you could see the side load on the tires of the towplane from the wind. Everything was going smooth, just slow. I think Andrew and I both thought about aborting, but after we picked up a little speed the Duo gets lighter and the acceleration better. We got off while Andrew flew down the runway with the left gear still on the ground until he could finish rotation. It was exciting. I probably won't ask for a repeat performance though as it's hard on the plane and the pilots. With the conditions on the ground deteriorating, I took a full 2k tow until we hit really solid lift at the powerlines and 33. 7-9knots average as we raced skyward. Joe was already at 5k or so and climbing out in front of us. Andrew returned to the airport and hooked up Ethan. Apparently not shaken in the least by the Duo and figuring everyone else would be easier. Initial climb NW of the field. We climbed through 5k and then started to explore for wave and more lift. There were stacked up layers of cumulus, especially down by the prison. By working towards the leading edge of them, we connected with wave and were able to climb through 6 and then 7k. A rare time to test all FAR cloud requirements at once. 500 below, 2000 horizontal and 1000ft above. There was a good hotspot at the Prison Ponds that was better than anywhere else we tried. We used that to bump up to 8500 at our high point. Joe reported wave farther out in the Foehn gap and heights of nearly 8000. Meanwhile Ethan and others battled with the crosswind takeoff and then broken thermals down low. Andy and Larry Johnson flew in Orange Crush. Pancho took the 1-26 up for 45 minutes in challenging and windy conditions. 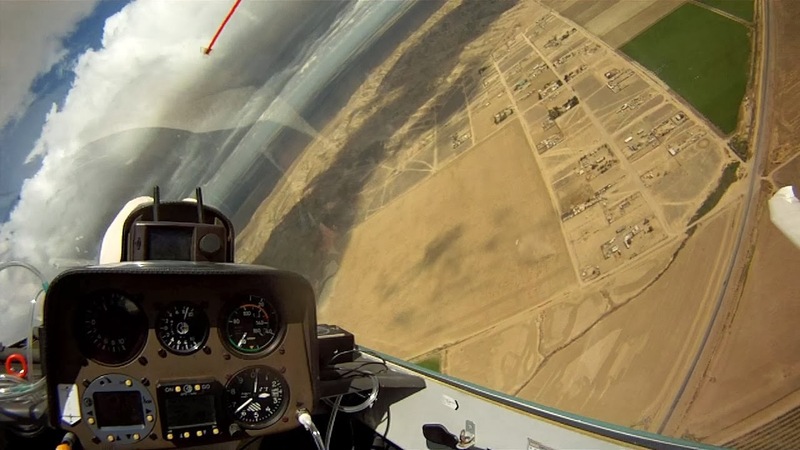 Great confidence booster to make a 1-26 flight stick in windy conditions. Jan took his DG up but found the thermals torn apart by the strong winds. There was enough convection to produce ripped up thermals, but also broke down the wave. Bart wisely chose to make his first Russia flight on a different day. 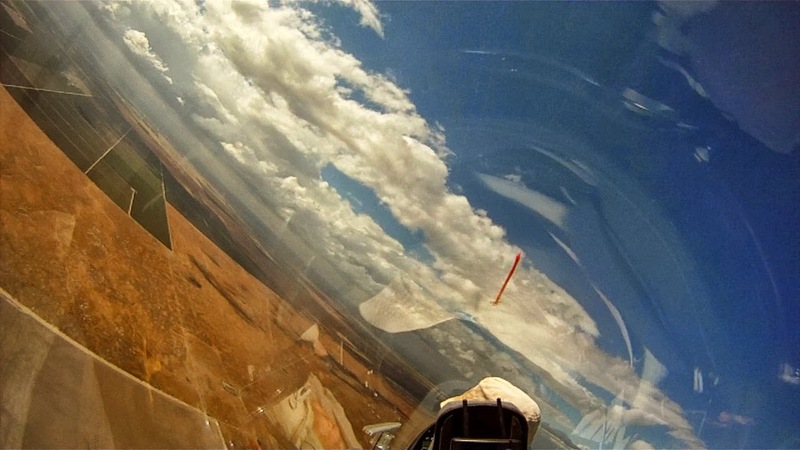 That kind of judgement is what we always need shown by anyone flying a new glider. After topping out at 8500 while waiting for Ethan to connect and climb out, we needed to get on a move. There was a strong cloudline to the East and NE. Initially I headed NE towards the buildup, but realized with the 5k bases, I could stretch our legs more. I turned NW along a wavebar and ran NW towards Harris Agro West off in the distance. Small cu dotted the way and kept us on a good line covering 25nm or so pretty quickly and without a turn. Near Harris Agro West we got a good look at the runway. Looks nice and open with room for a big glider like ours. From 5k everything looks pretty good though. Heading NE, we eventually turn NW towards the tall puffy cloud in the distance visible over the nearby clouds. We climbed here and then turned North towards Madera. We didn't fly too fast except for one run at 100knots when the cloudsuck got strong. About 15nm from Madera it got really soft. No good cu lines, though lots of deteriorating cu. Also nothing but trees between us and Madera. I downshifted and tried working a few weak bubbles. We barely had Madera on glide with a pattern. I edged closer, but hit a fair bit of sink. Now 8nm from Madera, but only a few hundred feet over glide and too many trees, I decided to stay near some landable fields. I spotted a dust devil in a dry field. Shortly thereafter another little one and we headed that way. We arrived over the field at about 1800agl. A bit low for casual comfort, but plenty high to work the lift off the dust devils. That got us back within safe glide of Madera and now a few more dust devils started to form nearby. Eventually we made it back above 4k and could connect the dots to the North. Below 2kagl and happy for consistent 3 knot lift. There looked to be a good line that wrapped around Yosemite Hidden Lake and then back to the South closer to Fresno and Sierra Sky Park. To the NW there was a large CuNimb that was forming an Anvil. Probably somewhere near the Pacheco Pass area. It was very dark out that direction. Beyond Madera, we were just 10 minutes behind it seemed. Cu were dying as we got to them with only sparse lift to 4k or so. We circled with some hawks over Yosemite Hidden Lake airstrip. Pushed east from there to the lake, but couldn't find a solid climb. Losing glide to Madera I headed back into the blue hoping to find a fresh thermal. Yosemite Hidden Lake. Actually Hensley Lake. Apparently the airstrip is named Hidden Lake because they hide all the water. Climbing through 5k. Madera is under the black low roll cloud of the approaching cell. The CuNimb had apparently collapsed and a very nasty black wall blocked the route to the NW. As we headed out towards 99 and closer to Madera it was not a welcoming looking site. Black cloud with a low wall cloud and below that a haboob dust storm was marching towards Madera. I've never seen one in person and never from the air. Now 8nm from Madera it was clear that it wasn't a good option. We were too low to reach Sierra Sky Park with much margin so I continued down the riverbed we were following. Surely in the bright sun, something would break free. About 3k, we did finally get the much needed climb. We climbed to nearly 5k in the gap between the dark mass over Madera and the next line of clouds closer to Fresno. We had options at least. Sierra Sky park and Chandler were easy glides. Madera was under a dust storm and pretty much out of the question. Working friendly air in between large cloud masses. Edging closer to the dust storm. Air up high was smooth and friendly. Didn't want to investigate down below. Heading South in the gap between the clouds there was friendly air. I edged closer to the nasty looking dust storm far below. Clearly there was a shear going on. We had S winds up high and winds were strong NW from in the dust. Keeping a very conservative glide to Sierra Sky Park, I drove deeper under the upper cloud shelf over the top of the dust storm. We were rewarded with fairly consistent lift, much like our typical convergence line. I flew slow, but we made headway into the 12knot headwind and stayed at about 5000ft. Well above the dust, it provided an easy visual reference for where to go. We eventually got within an easy glide of Harris Agro West and stopped for a climb to the NW of Lemoore. Looking down the runway, I'd switched over to their frequency to monitor for traffic. As we climbed, I checked in with the tower and let them know we were climbing and squawking 1202. Winds on the ground were 240 at 2knots. Directly below us they were probably 310 at 25 with dust streaming from the dry fields. 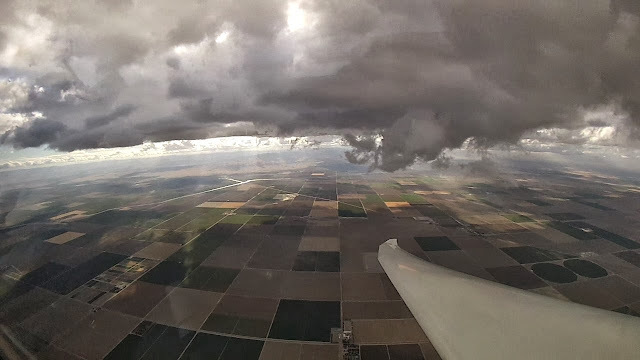 Final Glide to Avenal now from 25nm out or so. Ethan somewhere out off the right wing. Not visible. After clearing their airspace, we got an alert on Flarm. Ethan in YH was in the same area. A bit lower and 5nm to the west, we caught a couple of glimpses of his shiny wings. 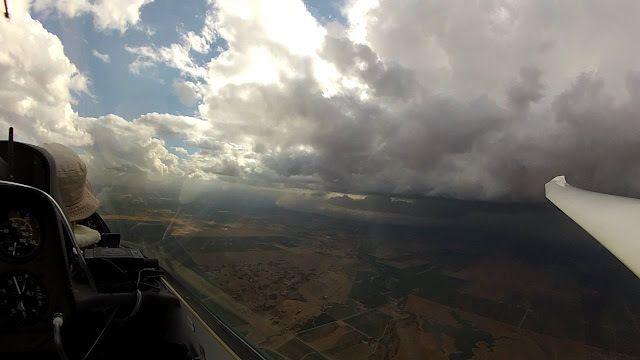 We worked up to a southern shelf of cloud at nearly 7800ft which gave us final glide to Avenal with a healthy margin. We got reports of 25mph winds 90 cross at Avenal and could see massive streams of dust at the north end of the Kettleman Hills. Pancho gave us a ground report as we edged closer. It was swinging 45 cross from the west. We had New Coalinga as an option, but there was clearly wave in the Avenal Valley. I pushed upwind to 33 before turning SE to Avenal. 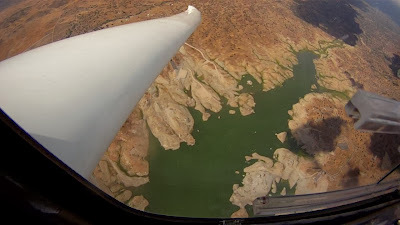 Better to stay upwind and find some friendly air rather than dive straight for Avenal with more wind on the nose and the potential for finding a line of sink. We made it back with a few thousand feet extra and when searching for the down wave. Found it west of the prison and lost that extra altitude quickly. Winds on the ground were West and stiff, but not completely cross. I opted for a right pattern to 31 over town to give me a longer base leg to judge the wind and my approach. On a high final, I could see the windsock swing nearly 90 cross and a series of gusts picked up lots of dust. Oh boy! Aside from a fat bounce, the landing was actually not a big deal. The Duo is so heavy that you can crab and slip it in and when you straighten out, it doesn't accelerate with the wind immediately. Ethan found a climb as we had left our good climb and was only about 10 minutes behind us in landing. He had taken much the same route as us back to the airport. We had to wait around for quite a while to find a lull that would allow us to derig the glider. I was considering just tying it down for the night and returning on Sunday to derig or fly. Too many things to do at home to really want to return though. Turns out Sunday was a very good day as well. Flight logs are up on the OLC for those that are interested. Sunday Sept 8th. Challenging, yet rewarding day.